I want to take a slight tangent from my breast cancer journey posts to discuss a recent event. One of my greatest challenges and lessons from my journey with breast cancer has related to embracing my God-given identity. That identity is unshakable and independent of our present circumstances. Like so many life lessons, when God allows us to experience something firsthand, he then gives us opportunities to share these valuable lessons with others. I have been sharing this lesson of embracing our God-given identity at MOPS groups and with my children. This posts focuses on a recent experience with my eldest daughter. My eldest daughter recently had her first outing with a friend and her friend’s family. This was the first time I let her do this unaccompanied by myself. I would be lying if I said I wasn’t nervous or anxious to hear how it all went at the end of the day. When she returned home I was eager to sit down with her and hear all about her adventures. What she relayed to me was not what I anticipated. Instead of sharing the fun she had, or the fact she and her friend were enjoying each other’s company so much they convinced both her mom and I to extend their time together, one thing eclipsed it all – teasing and bullying. My sweet tender-hearted daughter was so surprised to encounter children she did not know at an indoor trampoline gym whose first reaction to her and her friend were teasing and bullying. She was crushed and hurt by their mean actions and unkind words. My heart broke and filled with pride simultaneously. It broke over her pain and filled with pride over the fact that she could not fathom the motivation behind this unkindness. I am also impressed with her vocabulary arsenal. It is very powerful to put a name to an experience. When I was young I would have described her experience of being bullied as just another kid being mean to me. Both are true, but the fact that she has been educated on the topic of bullying automatically empowers her to know it’s not right and she should not have to endure it. I quickly shared with her how proud I am of her that she is a kind person. I told her a sad truth. I have been bullied and teased. Her dad has been bullied and teased. Her grandparents have been bullied and teased. While it is not right, we have all at one point or another been on the receiving, and if we’re painfully honest, the giving end of teasing and bullying at times too. It is a part of life, but that doesn’t make it right. Then I shared the most important truth – just because those kids said mean words doesn’t make them true or change who you are, that’s unshakable. As a child of God, she is loved beyond compare. God’s love has been given to her, so she can share it with others. I shared with her how not everyone knows about God’s love. Unfortunately others tend to treat people the way people they have been treated. So most likely those children who teased or bullied her are being teased or bullied elsewhere, maybe even at home. They aren’t being shown love, but we can show them love. I told her the Bible tells us to love our enemies and one way we can love them is to pray for them. So we did just that. We prayed for those kids to experience kindness and love. That she is loved beyond compare. Worth more than rubies. Worth dying for. Set apart. Full of light, life and love. A city on a hill set apart to shine God’s love into a dark and hurting world. A display of the splendor of God. Beautiful. Complete. Precious and honored. A child of God. Significant to God. That God declares her royalty, a real-life princess in God’s eyes. Thank you for saying those beautiful things about me. I told her those are not just beautiful words, I was praying Bible verses over her. I was praying who God says she is, how God sees her, and that I see her that way too. I agree with everything God says about her. That is the truth of who she is, and her identity is unshakable. It is unaltered by what people say, think or even by what happens in life. Her identity is constant, because God declared it in his word. We are who God says we are and I for one am so grateful for that! This conversation and her reaction have been on my mind for the past few days. I am so grateful that God equipped me through my experiences to speak truth and encourage my daughter when she needed it. 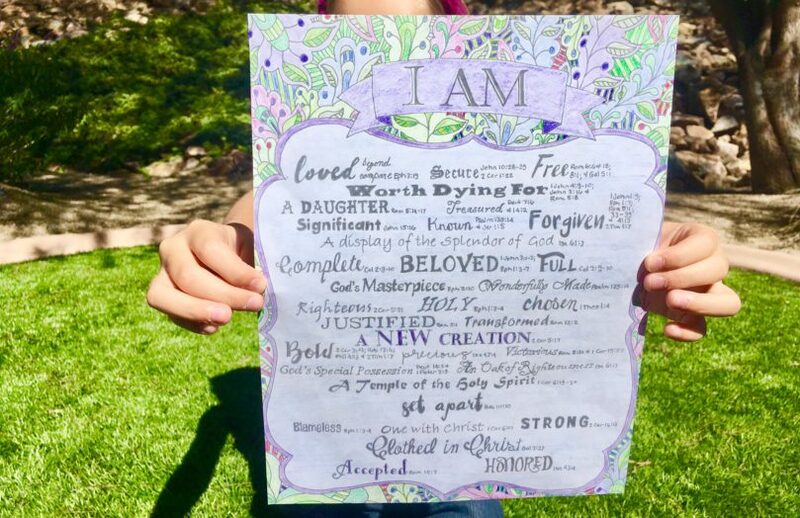 When I spoke about our God-given identity to my MOPS group I created a coloring page about our God-given identity. I gave copies to my two eldest to color. I read the scriptural truths about their God-given identity to them at that time, but it wasn’t until that moment that it really sunk in for her. Amidst her pain and brokenness the truth of her God-given identity ministered to her hurt and encouraged her. If you are familiar with Dr. Gary Chapman’s Five Languages, can you guess my daughter’s love language? It’s words of affirmations. Which makes it even more understandable why harsh words would wound her so deeply. How words of affirmation could bring hope and healing. Why words would elicit such a powerful response from her. Regardless of her love language though, the scriptural truths of our God-given identity have the power to bring anyone to tears. To heal, empower, encourage, embolden and instill in us our value and worth.